Walking your dog should be a pleasurable and health-giving activity enjoyed by you and your dog. Unfortunately, for many dog owners, a walk is often an out-of-control disaster zone. Fixed-length leash: A standard, fixed-length leash is an absolute must because it’s the perfect tool to help teach dogs to walk politely. Leashes that stretch or are retractable can actually teach and reinforce pulling behaviours. Instead, a fixed-length leash is just that, meaning there’s no guesswork on the amount of space the dog can venture away from its owner before hitting the end of its leash. The set length is important for teaching the dog that the freedom to move forward doesn’t come until the dog feels slack instead of tension. Length. A 1,8m leash is ideal for most dogs. Anything shorter than 1,2m increases the likelihood that the owner will grip too tightly on the leash without allowing for slack, thereby increasing the likelihood of tension in the dog (and increasing the likelihood of reactive behaviour). Material. The standard nylon leash can be an excellent choice, but climbing rope material leashes are an increasingly popular option. Both materials are ideal for their strength, durability and limited flex. In most cases, a leash with built-in bungee stretch will cause challenges for owners trying to teach loose-leash walking skills. It can also make it more difficult to reel in the dog when needed. 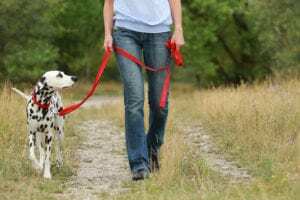 However, for owners with pain or mobility issues, these options can help reduce the jarring pull to joints if the dog suddenly lunges and hits the end of the leash. Other features. Some leashes are equipped with carabiner clips that allow for a quick clip to an eye bolt or around a fixed point (like a tree) for a hands-free training session or around the waist for a mobile, hands-free walk or training session. Chat with your EberVet Vetshop about your dog’s leash and collar leads. They have a wide variety of leads and collars in stock and can offer advice on what’s best suited to your needs. Retractable leashes prove problematic in almost all situations. Most (if not all) of us are familiar with the unwelcome greeting of a dog rushing up or the fearful dog that panics and flees away in desperation when the leash handle slips out of its owner’s hand and “chases” behind the fleeing dog. But if they are going to be used, do not use in crowded spaces like sidewalks, the veterinary office or a training class. Rather, they need to be limited to an open area, such as a large park, where the dog can actively move and sniff with freedom without impeding upon other dogs. If using a retractable leash while leash training, use a back clip harness rather than one that clips in the front or clipping the leash to a flat collar. This can help the dog differentiate the situation and, by extension, reduce the unwanted pulling. 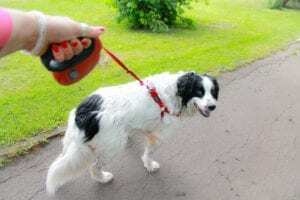 Waist-worn leash: Waist-worn leashes are excellent hands-free options for jogging and multitasking situations (such as pushing a pram and walking the dog at the same time). They can also work well for dog-training class or training while out on walks as the owner’s hands are free to reward the dog for right behaviours. Look for waist-worn leashes with a quick-release option in the event of an emergency. Jogging-specific leashes may use a stretchy material for the length of the leash. 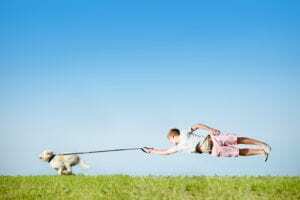 This can be beneficial for reducing the jolt to both the owner and the dog as changes in pace or direction are made. However, for teaching and retaining loose-leash walking skills, the stretch can cause problems. Long line leash: Long line leashes allow the dog to have more freedom without the owner losing control. Any device that causes fear or pain to incentivise the dog to remain close to its owner (such as prong, pinch, choke chains and shock collars) comes with risks. These include creating unintended negative associations as well as causing repeated physical pain and psychological trauma without actually teaching the dog what to do instead. Harness: Harnesses can be a great option, but the structure and fit are important considerations. Certain harnesses cross over the front of the dog’s shoulders and chest, and while these can be helpful for deterring pulling in some instances, they can cause mobility challenges and their use is limited to a shortened period of time. Other options center in the front of the dog’s chest, which allows for more free movement of the dog’s shoulders as it walks, jogs or runs and increases the amount of time the dog may be comfortable wearing the device. Back-clip harnesses can be an excellent option for allowing dogs to freely explore (as may be done on a long line). However, for dogs that pull or are difficult to control on the leash, the back-clip harness adds to the owner’s challenges. Tightening harnesses have a limited slip function that provides gentle pressure to a fixed degree as the dog walks to help deter pulling in a gentle manner. Multifunctional harness and leash systems allow for varied hook-up points. This flexibility in functionality can prove to be a handy tool for adjusting to the given walk scenario and allow for graduation during the training process of teaching the canine to walk nicely on a leash. Flat collars offer an option for ID tag holding and a quick clip for walking the dog. However, they may also add additional stress to the canine’s throat and do little to decrease the strain with dogs prone to pulling. Head halter: Head halters control the dog’s nose, mouth, head and, by extension, its entire body, in a way that’s similar to how horse halters function and are especially helpful for dogs with pulling issues and those that would benefit from increased direction (such as reactive dogs). However, dogs will need an adjustment period to get used to the halter, and owners will need to be taught how to use it. rward doesn’t come until the dog feels slack instead of tension. Dog walking should be a pleasure, not a pain. Use these tips to ensure an enjoyable outing for both you and your dog.